"Welcome to Dumpling Kingdom." This is how you are greeted when you come into our welcoming, caring, high-energy restaurant, and we promise to do whatever it takes to serve high-quality Chinse food to every guest consistently. Welcome! We are glad you are here. 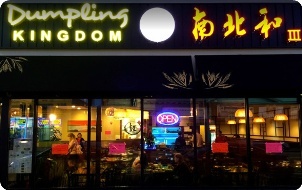 Dumpling Kingdom has a wide selection of dumplings, including vegetable options as well as duck, pork, chicken, beef, and seafood. There are also appetizers like chicken wings, scallion pancakes, and meatballs, in addition to the wide range of soups, house specialties, fried rice, noodles, and much more. Dumpling Kingdom is open seven days a week from 11 a.m. to 2 a.m. Check contact / location to see the details. Dumpling Kingdom provides fast delivery service. The minimum order of $15.00 is required for delivery. The delivery fee is $2 in 1.5 miles range, $3 in (1.5-2.5) miles, $5 in (2.5-3) miles. We don't deliver beyond 3 miles.